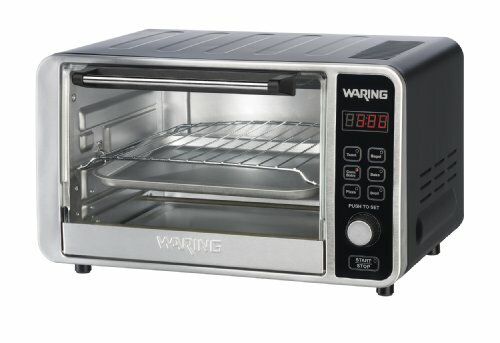 The Waring Pro TCO650 Digital Convection Oven is an affordable and easy to use countertop oven which is useful for everyday baking and cooking needs. With ample capacity, aesthetic design, economical power consumption and non-toxic interior, it is perfect for its price. This product also comes with three cooking modes, Bake, Broil and Toast, plus Convection-bake, Bagel and Pizza options. These are precise and work well. The stainless steel body on this oven makes it look very pleasant to the eye. It also helps prevent rust and contributes to the overall durability of the product. This oven is big enough to toast 6 slices or a twelve inch pizza, which is not a bad size considering the fact that it can fit almost all kinds of food products that are used in everyday life. Unlike other ovens with the similar price, this oven has a digital timer making it easy to keep timing precise, and a LCD display showing the time information. One of the problems that are commonly seen in other ovens is that the buttons lose their labels. This does not happen with this oven because it comes with touch panel buttons which are easy to use, which adds some extra points. Although this product is known to be durable (its predecessors have a good reputation in this regard) it still comes with a five year motor warranty which is not commonly seen on other ovens, adding to its reliability. The customer service is also known to be exemplary, like Breville. The removable bottom tray makes this oven easy to clean. This is a further addition to the oven’s many advantages with respect to ease of use and convenience. What Do Customers Say About The Waring WTO650? Better Performance – Its cooking performance is up to the mark, according to several customer reviews. Most customers have no complaints with this product’s in-built bake, broil and toast functions, and reviews say that the oven cooks well on all three modes. When baking, you can set the temperature and the timing, and when the oven is done cooking; it makes a beeping sound to alert the user. Customers are satisfied with the oven’s baking performance, saying that it cooks properly from the inside and leaves the outside part crispy and fresh. Similar easy-to-use controls exist for the broil mode, and this simplicity makes the oven easily operable. The toaster mode also performs well. Customers have reported that the pre-set modes help in selecting the toast shade, and although it is not completely precise, both sides come out nicely. Design and Layout – The layout of the buttons is also intelligently done, and you can easily take out the bottom tray to clean the oven. In addition, the stainless steel body, overall design and layout are aesthetically pleasing, thus this oven looks good sitting on the countertop. The digital controls make temperature settings more precise, and the convection feature makes cooking faster. Price – Customers who has used it for a long time says that it is incredibly cheap for all the features that it offers, and is therefore an excellent choice. Aluminized Steel Interior – One of the best features of this oven loved by some users is that it does not have a non-stick interior. Many customers who want to switch over from microwave ovens for safety reasons find this feature to be very attractive, because non-stick interiors are thought to leave toxins in the food. Convection Fan – Some customers have noticed that the convection fan also makes a loud noise, which is a design issue since the fan touches the housing when it runs. However, for most people this is not a serious problem considering the advantages of the oven. Oven Racks – Fitting oven racks into the oven is known to cause difficulty to some customers, but is easily mastered over time. It also does not come with additional oven racks. You can purchase them from the manufacturer for a small price. Or you can also purchase my recommended toaster oven accessories. Housing – Like most toaster ovens, the body can sometimes get a little hot, so it is recommended that oven mitts are worn when using this product. An issue that the oven poses for some customers is the loud alert sound that it makes when the timer runs out. Luckily, it can be turned off by pressing the toast and bagel button for about five seconds. This oven is perfect for those who are looking for a convenient product that is easy to use, affordable and can cook most items of everyday use. It is affordable, durable, aesthetically pleasing and performs well under different cooking conditions. However, it is not too large and even though it has all the functions that are required for the average person, if you are looking for an oven that has loads of functions and large capacity, this product is probably not for you. For everyone else, it is a great find and its durability makes it able to continue helping you cook brilliantly for a long time.